As an innovator in measurement and control products for embedded applications, there is no product precedence, making it difficult for companies to understand what we do. 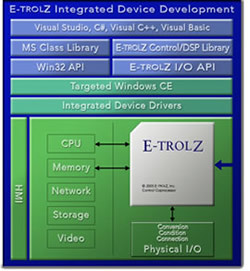 It is therefore natural to compare E-trolZ to single board computer suppliers, where, at the most basic levels, E-trolZ products could be classified. However, one must understand our technology and degree of integration to realize the advantages E-trolZ’s products deliver. 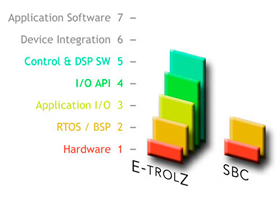 Once you understand our DPTCA™ and 5 Degrees of Integration, you’ll see that E-trolZ is far from a single board computer supplier. 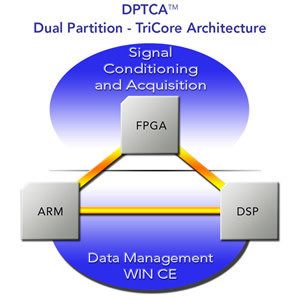 Our Dual Partition TriCore Architecture is the result of years of real-time measurement and control product development experience. The electrophysiological measurement partition is dedicated to the I/O access and control process; reading and writing I/O in a precise and repeatable manner. The data management partition is dedicated to communications, file management, and user interface processes. Knowing and understanding that the success of any device depends on the ability to access and control I/O in a reliable, repeatable, and timely manner, our architecture dedicates specific processors to execute completely independent threads with a designed priority to the electrophysiological measurement partition. With a programmable FPGA managing the real-time I/O partition, I/O access and control is guaranteed independently of the data management partition. This is dramatically different from most single board computer approaches which use the main, and only, processor to handle both tasks. Heavy user interface or communications requests will consume bandwidth and as a result, interfere with the performance of the I/O access and control. Furthermore, any RTOS, driver, or application failure will stop the whole system. By design, E-trolZ’s dual partition architecture eliminates these scenarios entirely. The FPGA is programmed and optimized by E-trolZ, requiring no effort on your part. For OEM’s with sophisticated I/O performance requirements or proprietary needs, E-trolZ can provide access to the FPGA design. The ARM and DSP processors are programmed with standard Microsoft programming tools including C, C++, C#, and Visual Studio. Measurement and signal processing expertise in the form of a class library are available for both processors. Each E-trolZ product is more complete and ready to use than any other development approach available for OEMs. By integrating the hardware, I/O, drivers, RTOS, and API into an electrophysiological platform, you are ready to begin application programming and testing right out of the box. While single board computer suppliers deliver hardware and RTOS / BSP solutions, they require the OEM to develop their own “base board” to add application I/O and breakout the signals. This requires a full PCB design, procurement, assembly, test, integration, and verification effort. And you can forget about an I/O API and application expertise. E-trolZ includes all that effort in every product and then some. Our I/O API provides function calls to configure, read, and write the I/O through a proven and standardized interface. The next degree of integration is signal processing and process control software routines. These proven and standardized functions deliver application expertise to solve, manage and analyze the data acquired. The dual-core OMAP™ processor integrates a TMS320C55x DSP core with an ARM925EJ-S core on a single chip for the optimal combination of high performance with low power consumption. This unique architecture offers an attractive solution to measurement and control developers, providing the low power real-time signal processing capabilities of a DSP coupled with the command and control functionality of an ARM. Microsoft® Windows® CE 5.0 is an open, scalable, 32-bit operating system that integrates reliable, real-time capabilities with advanced Windows technologies. Windows CE allows you to build a wide range of innovative, small footprint devices. A typical Windows CE–based device is designed for a specific use, often requires interoperability with other computers, and requires a small footprint that has a deterministic response to interrupts.